Region: Many species throughout North America. Life cycle: Several broods every year. Most die in the winter leaving only the younger queens who hibernate in well-protected spots. Feeding characteristics: As with the honey bees, the workers feed on the nectar of a variety of plants and are excellent and much needed pollinators. While on each gathering trip, they visit many different plant species, making them less efficient than honey bees. 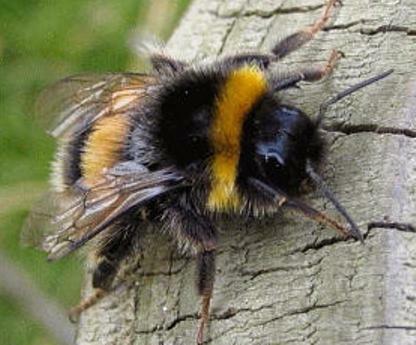 Physical Description: This bee is black, very fuzzy and sometimes sports a yellow band on the abdomen. There are spurs behind the hind legs and that grow to a length of 1/3 to 1 inch. The eggs are laid in or on the ground.